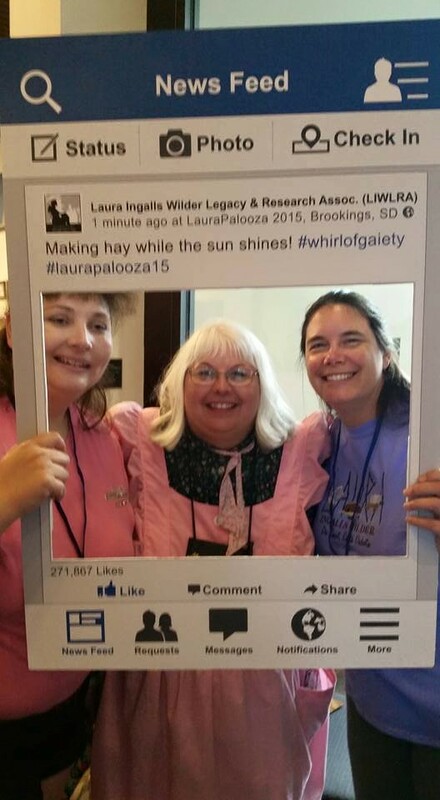 Wilder Wednesday posts are inspired by the Little House on the Prairie book series by Laura Ingalls Wilder. A friend recently turned me on to Sarah Albee’s blog, which I’ve been enjoying. Not long ago, she posted about the trend of gender-specific colors, which you probably know is a relatively recent development. I wanted to know why these trends developed, and found some interesting theories. It was around the mid-1910s that colors were “assigned” to specific genders. Before that, both genders were usually dressed the same. Same styles and same color – white, for a very practical reason: the inevitable stains could be bleached out. 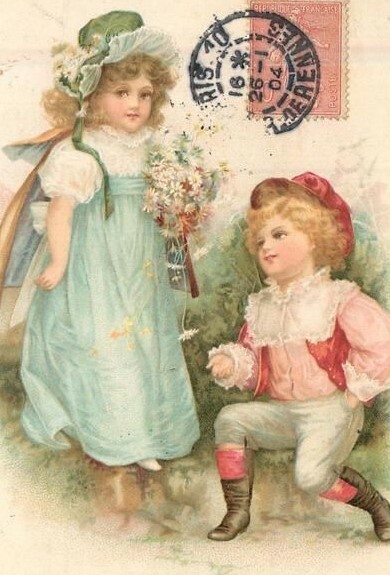 But some market-minded person realized that if mothers could be persuaded to dress their children in colors, there would be more sales; and if the genders had different styles – including different colors – that would be even more sales (succeeding children of a different gender couldn’t wear the older sibling’s clothing). For some time, there was no consensus on what those colors should be, but eventually pink and blue took over. Pink was designated as the color for boys, and blue for girls. It is supposed that this selection was influenced by Renaissance art, which usually depicted the Virgin Mary in blue and the Christ child in pink. Blue has traditionally been associated with the heavens and purity, and thus appropriate for females, who were viewed as more virtuous. Pink is a derivative of red, a bold and aggressive color, so it was suited for masculinity. Trade publications of the fashion industry promoted these choices, along with other differentiations such as that blue was flattering for blue-eyed blonds and pink for brown-eyed brunettes. This encouraged more sales among even same-gendered children. Timing begs the question, did Laura’s story of the ribbons actually happen? Or was it inspired by the fashion of the day that she was writing? Perhaps it could be read as an indictment of silly fashion trends – why on earth shouldn’t she enjoy ribbons of blue, or any other color, just because her hair was brown? Or perhaps the opposite: showing children that there have always been social norms to which they should conform. This scene in On the Banks of Plum Creek could be polysemantic. Or maybe it’s just a fun scene. What do you think? So when and why did pink and blue switch genders? Theories abound, ranging from nursery rhymes to Hitler. Some believe that verses such as “Little Boy Blue” brought the change. Others claim that the purple triangle assigned to homosexuals under the Nazi regime led to the color being thought of as feminine, and then lightened to pink for female children. Still others mention the influence of “battleship gray” and “navy blue” in World War II in identifying blue with boys. There is no real evidence for any of these theories. During the 1940s, an advertising company surveyed sales of several large department stores across the country. They concluded, based on what customers chose, that boys preferred blue and girls preferred pink. (It would probably be more correct to say that parents preferred blue for boys and pink for girls, but this is not definitive since we don’t know to what extent parents let the children do the choosing.) Manufacturers adjusted accordingly. After a time of mostly unisex clothing during the ‘70s, coinciding with the women’s lib movement, the pink-for-girls-blue-for-boys came back with a vengeance in the ‘80s. It seems this stems in part from the homophobic idea, now understood to be incorrect but for centuries held as incontrovertible, of gender as binary. The phobia was (is?) so deep-rooted that it was deemed insulting not to know at a glance whether an infant or young child was male or female, but of course one can’t know without some added contrivance – like color-coding. Recently, there has again been movement away from “gender-appropriate” color. I wonder what Laura would think. Wilder Wednesday posts are inspired by the Little House on the Prairie series of books. Far over the prairie rang Pa’s big voice and Laura’s little one, and faintly from the creek bottoms came a last whoop from Mr. Edwards. 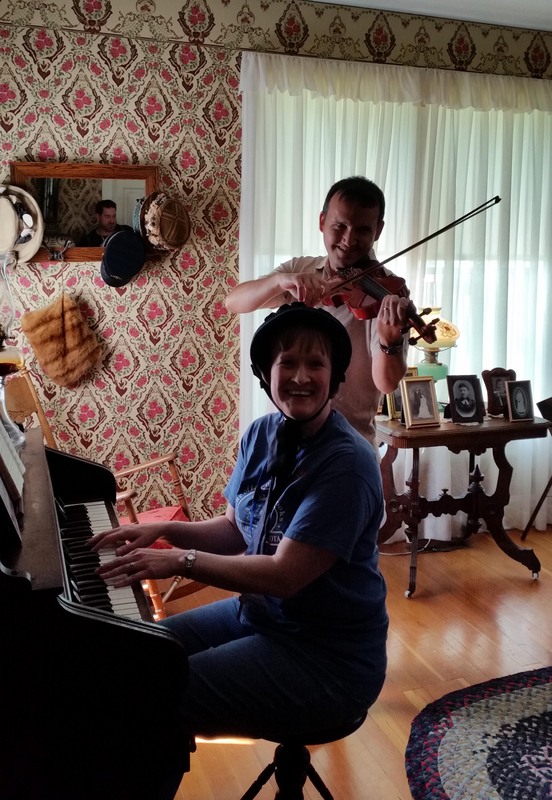 The Ingalls family loved music, most often supplied by Pa’s fiddle. Laura recorded dozens of songs that the family enjoyed. 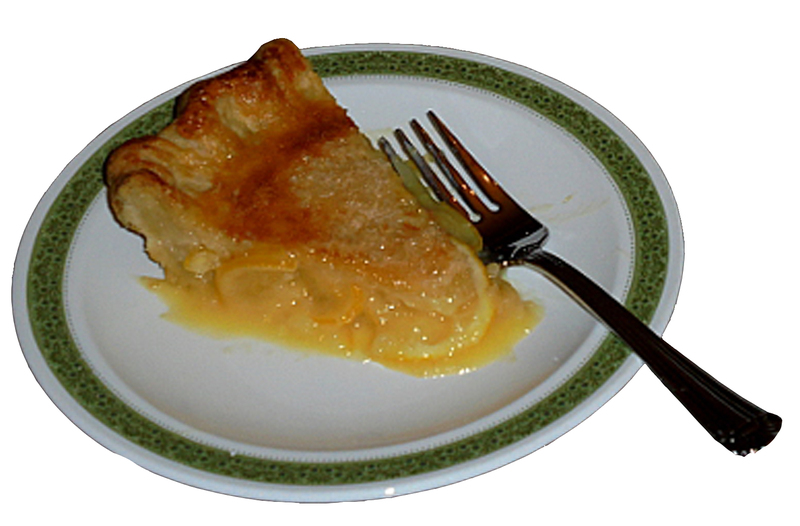 One of these is Old Dan Tucker, more strongly associated with Little House on the Prairie due to the character of Mr. Edwards, who sang it often on the TV show. 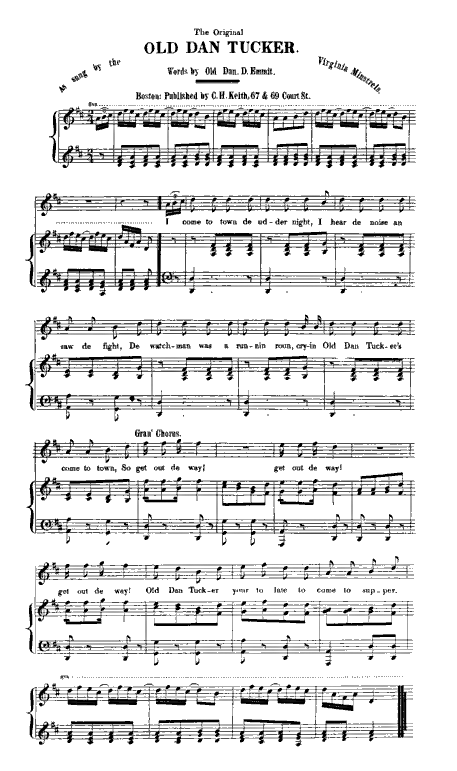 The song dates from the middle of the nineteenth century. It is not certain who wrote it, although it is often attributed to Dan Emmett (who also wrote Dixie). It is certain that his blackface troupe Virginia Minstrels made it popular. It was the usual practice for blackface troupes to portray people of color as ignorant and uncouth, or worse. Old Dan Tucker, according to the 1843 lyrics (which can be found at the end of this post), was a fighting, drunken glutton who had no sense of, or didn’t care about, social mores. He sometimes speaks of himself in the third person, as a child might, which is to further show his simple-mindedness. Part of the appeal of this portrayal is that it allowed “lower class” whites to poke fun at the culture of the “upper class” in an analogous way, as opposed to outright finger-pointing, which would only further cement their own lesser-mannered class. 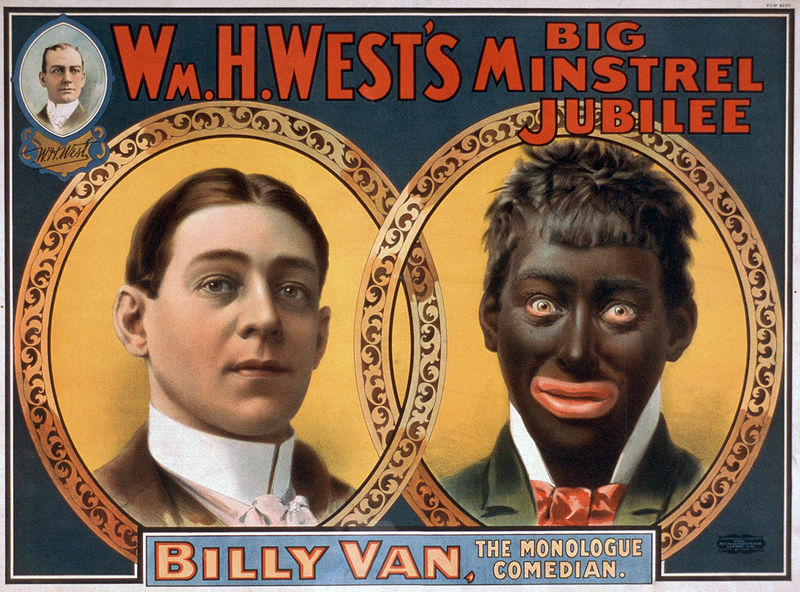 It is important to note that both black and white performers used blackface. 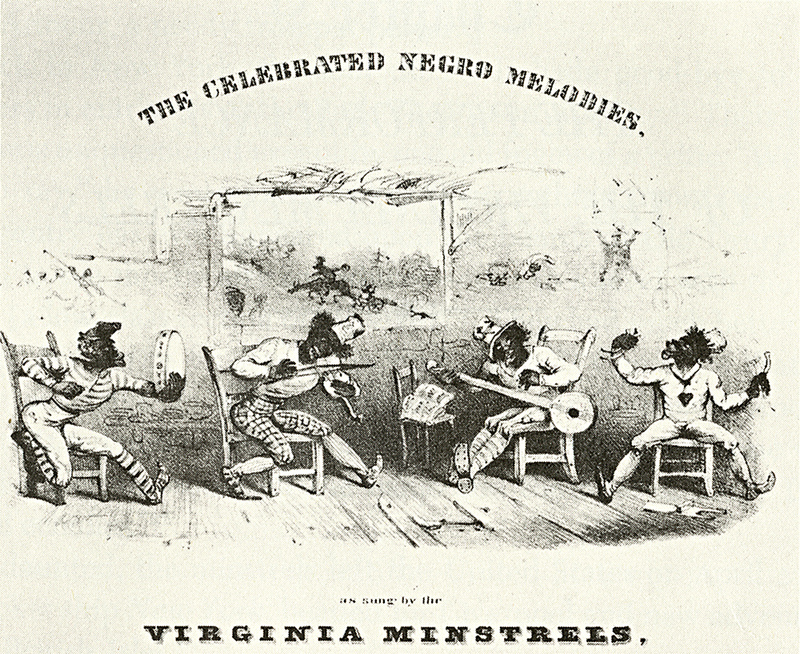 Black minstrel performers often satirized the behavior of whites, including their racist attitudes, and promoted abolition. 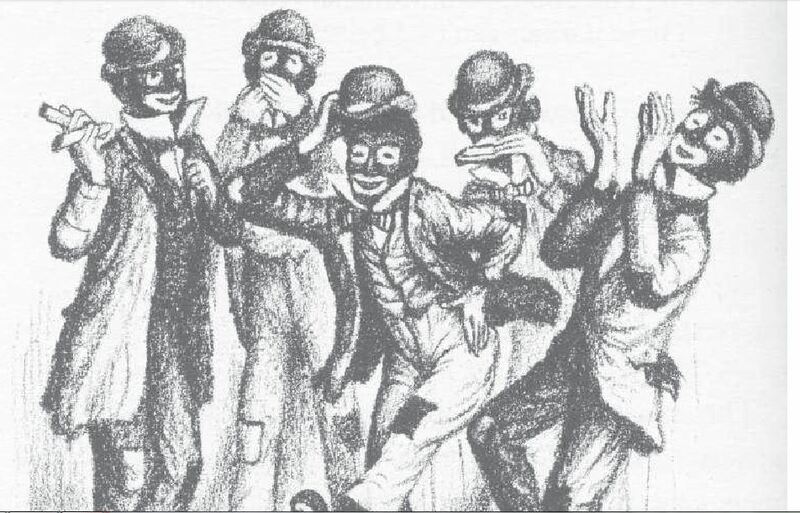 By the 1870s, white minstrel shows were giving up blackface (often incorporating other ethnic stereotypes, such as the blarney-filled, drunken Irishman, or greedy, conniving Jews, instead) and black performers were taking over blackface theater. Some African Americans saw it as a means of spreading their own culture, while others realized that it was a much easier way to earn a living than most avenues available to them (which was mostly menial labor). This does not, of course, excuse the caricaturizations of black people by white minstrel performers in blackface. Old Dan Tucker was immediately successful and became a popular song across the country. In fact, it was one of the top 3 most popular songs in 1843, thanks in large part to the Virginia Minstrels. However, its lyrics did not remain static. Performers added, deleted, and changed verses as it suited them. Hundreds of different versions have been recorded. Some of these promoted specific causes; for example, in 1844 a group called the Hutchinson Family Singers turned it into “a song for emancipation” with abolitionist lyrics. Other versions were designed to eliminate the racist portrayal of blacks and convert it into a generic, fun tune. That is how we today think of Old Dan Tucker. Its history should not make us shun the song, but learn from it. Let its modernized verses bring to mind Mr. Edwards and his helpfulness and neighborliness – to everyone, regardless of their race or color – and enjoy it as an entertaining bit of Americana. Here’s a mix of that version. What do you think? Does the dark history of Old Dan Tucker change how you think about the song? Should it? Cryin Old Dan Tucker’s come to town. So get out de way! Get out de way! Get out de way! Old Dan Tucker. Your too late to come to supper. If he hadn’t got up he’d lay dar still. I’ll shabe you soon as de water get warm. He ‘hole hog wid de tail and all. The second day of LauraPalooza lived up to the expectation set by the first day. The opening presentation was by William Anderson, preeminent LIW researcher, who announced his forthcoming book, The Selected Letters of Laura Ingalls Wilder. From the earliest existing letter written by Laura (to the Eastern Star chapter in De Smet, and which is also included in my book Little Lodges on the Prairie) to the last, this book will be the last words of Laura that we’ll have. I’m really looking forward to it. Then Julie Miller gave a moving presentation about her life on an Iowa Century Farm. She experienced many of the same things Laura did. Eddie Higgins of the UK talked about her experience reading the Little House books across the sea, and some of the things that didn’t make sense due to differences in British English from American, and things that are just unfamiliar across the sea. Did Pa get suspenders or braces for Christmas? It depends on where you live! The next two presenters also had some of those same issues. Hisayo Ogushi and Yumiko Taniguchi are both from Japan, and spoke of the influence of Laura in that country and the translation of the books into Japanese. We had another wonderful lunch, during which John Miller spoke of Laura as a Midwesterner. After lunch, there were hand-on workshops. Choosing among crafts, woodworking, and writing was probably difficult from some people, but of course I went straight to “Write Your Own Little House Story” with Kelly Kathleen Ferguson. She led us in exercises to enhance creativity in writing, using our experiences with the Little House books. The afternoon presentations dealt with addiction in the 1800s, finances and well-being, Charles Ingalls’ time in Illinois, and the similarities of the Little House books to fairytales. All were interesting and informative. After the last presentation, I went to supper with four friends. We spent 4 hours visiting, and laughed so hard we cried (I did, at least – and I know I saw a couple of them wiping their eyes a few times, too). And there was still the field trip to come! The rest of the group then went on to the surveyor’s house and the first school in De Smet, but I broke off (I’ve been to those locations several times) and went to the Masonic Lodge to see if I could help set up for a special Eastern Star program that was going to be held later in the afternoon. It ended up being much smaller than anticipated; the driver of a group that was coming from out of town injured his foot at the last minute and had to go to the emergency room, so that group didn’t make it. Still, it was nice to visit with those who were there and talk a little about Laura Ingalls Wilder and the Eastern Star. As an added bonus, a few of my group from LauraPalooza came by and got to view a few special items: the original copy of that earliest letter that Laura wrote mentioned above, along with an original letter written by Carrie and one written by Grace; Pa’s original petition to join the Eastern Star; the actual minutes of the meeting at which Laura joined the Eastern Star; and the sword Pa used as Tyler of the Masonic Lodge. 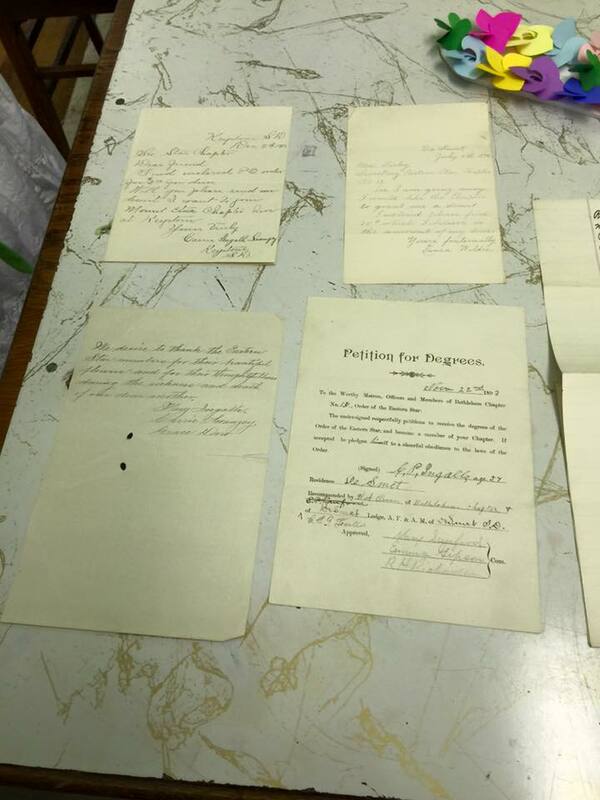 Letters written by Laura, Carrie, and Grace, and Pa’s petition to the Eastern Star. 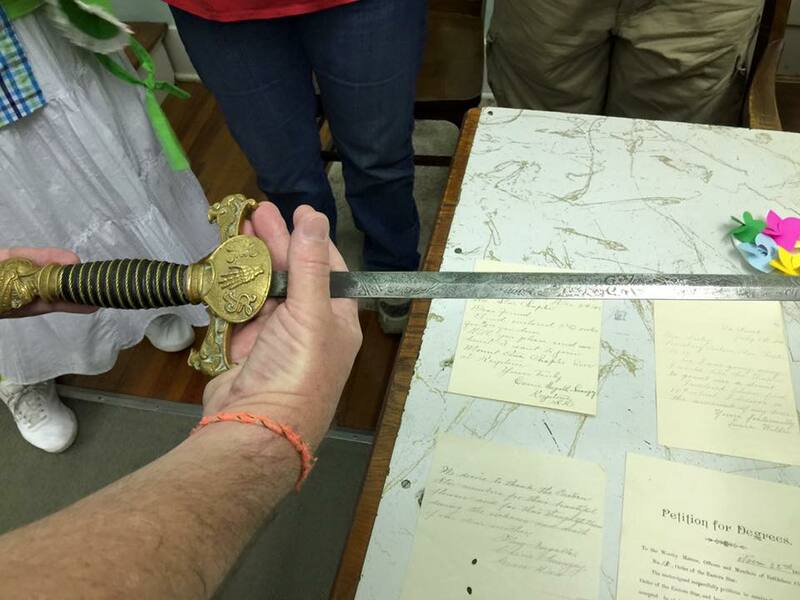 A few “LauraPaloozers” got to hold the sword Pa used as Tyler of the De Smet Masonic Lodge. I snuck in a cemetery tour with Nancy Cleaveland. Later, I met up with my little group again for the pageant. We had fun at the photo board, even though the sun was shining right in our eyes. The pageant was the last activity. We said our goodbyes, but we’re all on social media so we can keep in touch until LauraPalooza 2017. And who knows, maybe we’ll meet up at a LIW site or somewhere before that. Here’s hoping. Even though the conference was over, my adventure wasn’t. Stay tuned! LauraPalooza was a great success. My fun started early. Since we were going North, through Kansas, we had to stop at the site of the original little house on the prairie, right? Although everything here is replica (except the well, which has been filled in), it has a certain charm to it. Then we went to De Smet for a couple days of research before the conference began. One thing I did was search records of the Congregational Church. I saw the history of the church as written by Ma, where Pa joined by letter from Walnut Grove, and Ma’s membership in the Ladies’ Aid Society, among other things. Did you know that the bell in front of this church (now the UCC) is the bell from the original Congregational church building that Pa Ingalls helped build? This is the bell Laura and her family heard ringing. 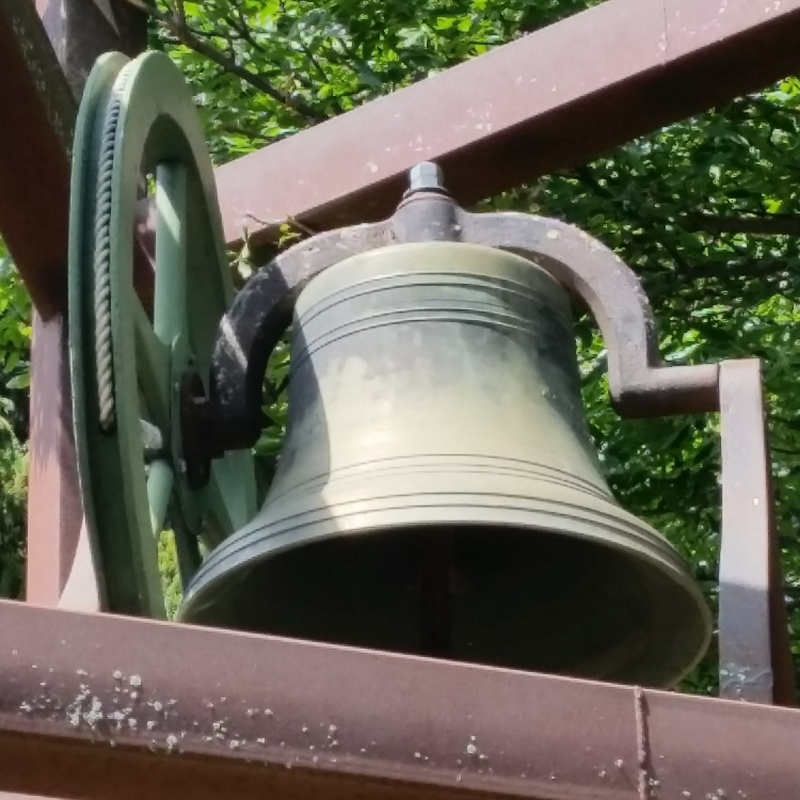 The bell from the original Congregational Church that the Ingalls family attended. 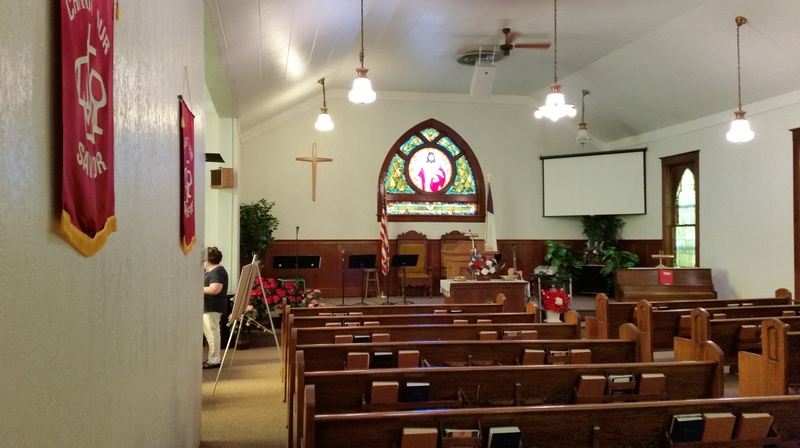 The original building of the Congregational Church has been built onto and remodeled, but the original structure is now the sanctuary of Christian & Missionary Alliance. 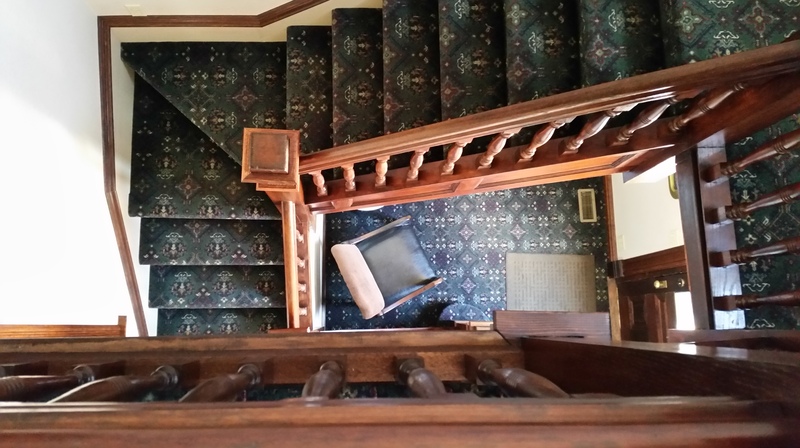 I also finally got a chance to check out the interior of the Heritage House B&B. The upstairs of this building was used by the Masonic Lodge and Eastern Star for many years, including most of the time the Ingallses were members. I can’t help but wonder if the winding staircase was built that way specifically for the Masons, since that figures into their Fellowcraft Degree. Then it was on to Brookings and the opening social of the conference. The social was held in the South Dakota Art Museum on the SD State University campus. This museum is home to the largest collection of Harvey Dunn works. Dunn was, of course, a nephew (by marriage) of Laura’s sister Grace. It was fun to see friends made at the last conference, though we missed a few who were unable to attend this year. 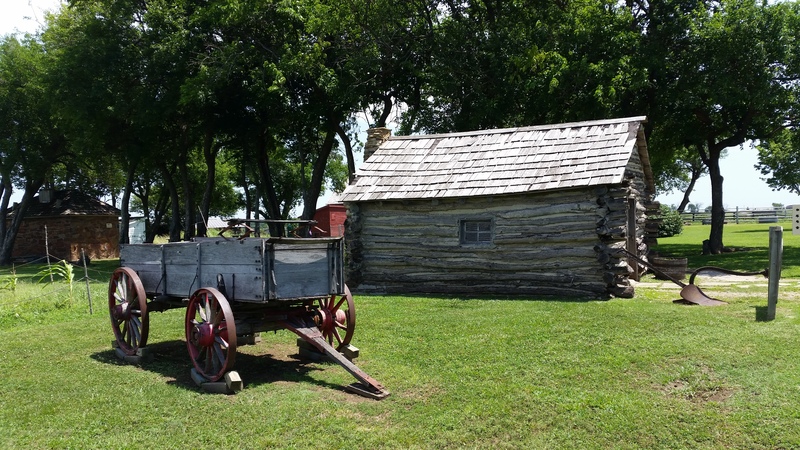 Thursday morning, the conference was off to a great start with Jim Hicks, who showed how he was able to pinpoint the exact location he believes “Grandpa and Grandma” Ingalls’ house was – the one where Laura went to the sugaring-off dance. Next, Dr. Beth Tarini discussed the probable cause of Mary’s blindness. Hint: not scarlet fever. After a short break (snacks provided!) Laura McLemore and Judy Green discussed how they handle racism, sexism, and other uncomfortable topics in the Little House books. Oh NO! What do you do about THIS in the Little House books? I agree with them that rather than censoring, we should use these paragraphs to teach youngsters (and some not so young) why people held those views, and why we shouldn’t. “Rewriting” history by ignoring the ugly part of it is not only untruthful, but also deprives following generations of the chance to learn from it. Amanda Baumann followed with a presentation on 19th century schools (why was spelling so important?). She acknowledged learning much from Nancy Cleaveland, who has recently updated her booklet on Laura’s school/teaching days and made it available for purchase from the LIW museum in De Smet. Lunch was a wonderful meal, made more wonderful by the presentation of the Legacy Awards during that hour. John Miller was a recipient, for his years of in-depth research on Laura and her place in history. Sally and Larry House, who were instrumental in establishing the Wilder farm site in Malone (where Farmer Boy was set) as an historic place, also received an award. I understand there were terrific presentations after lunch, too, but unfortunately I missed those. During that time I was in the vendor room with Prairie Sayings posters. Folks seemed to really enjoy them. And that evening was the authors and artists’ reception, where I felt privileged to join writers such as John Miller, Pamela Smith Hill, Bill Anderson, Nancy McCabe, and others, to sign copies of our books for attendees. I finally got a signed copy of My Life as Laura; I didn’t get one at the last conference and had regretted it ever since. But no more! All the presentations were both fun and informative. They are what the conference is all about. 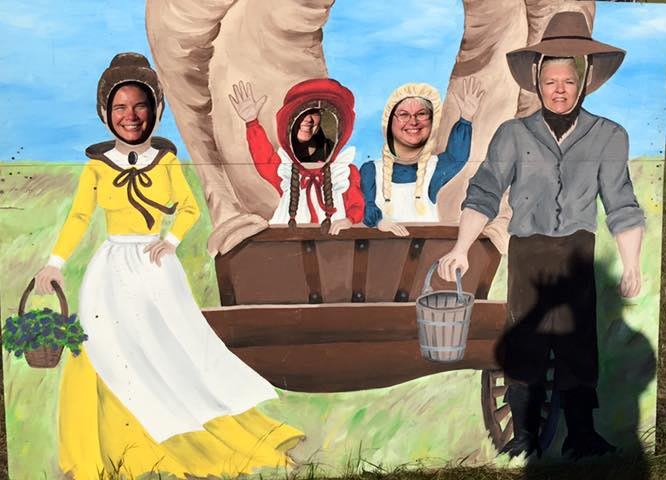 But I must say, visiting with fellow “bonnet heads” (Lauraratti, prairie people, whatever you want to call us) is a big part of what makes LauraPalooza so fun. 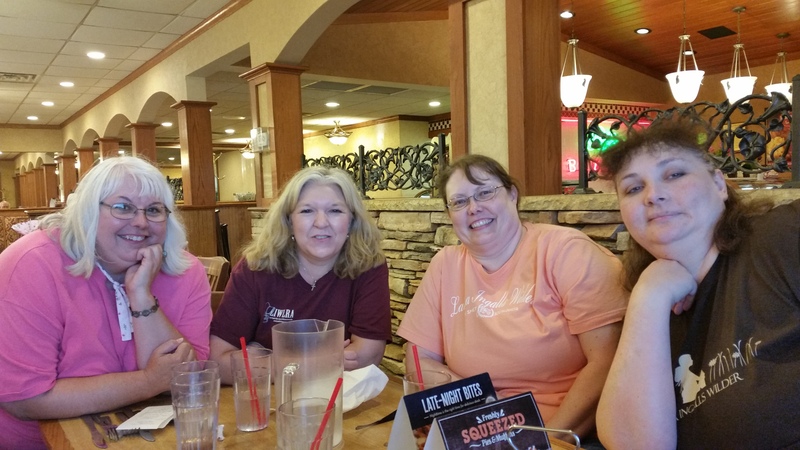 It was great to meet new friends, catch up with others, and chat about our favorite author – and so much more. Catching up with friends made at the last conference. Where are the Masonic Monday and Wilder Wednesday posts? I’m sorry to have missed several Masonic Monday and Wilder Wednesday posts. I’ve been at LauraPalooza, and also having computer issues at the same time. The posts will be back, along with a recap of LauraPalooza 15, and more, soon.